Today we are continuing our exploration of Block Placement Methods. So far we have talked about Fill Methods and 2 point, 4 point and multi-point placements. 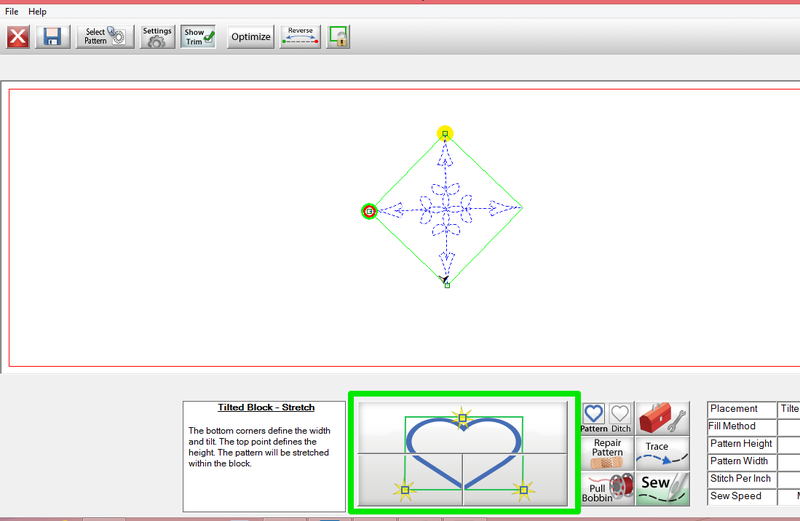 Today we will be looking at how to place things in blocks that are on-point and triangle shaped blocks. 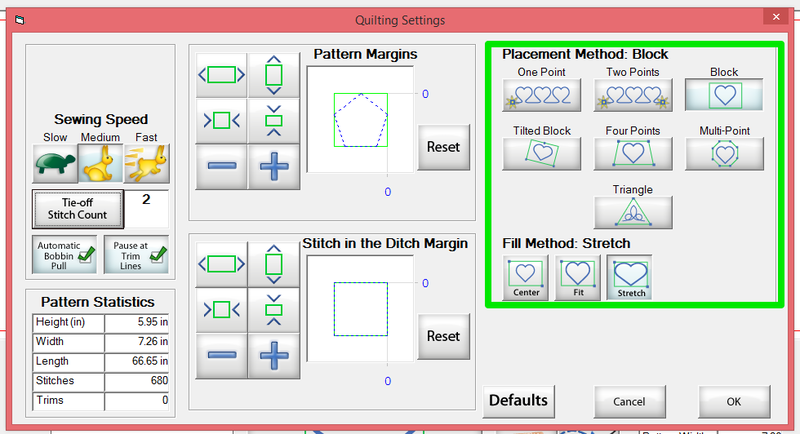 We will be starting in the Setting option of the Select and Sew - Pattern screen. Here are two of your options for blocks on point. You can either use the Tilted Block option or you can use the Four Point option. For the Four Point option you just click on the corner like you would if it was a straight set block. It is easy and effective. There is also a Tilted Block option. Which to me is a little harder to use. I am still not sure when it would be better to use because you only have 3 points to set with. The top button is used to set the top of the the block and then the bottom 2 buttons are used to control the tilt and width. I am sure that is an application where this makes sense, but it is more difficult to use the the Four Point method. If I find a place where Tilted will work better, I will blog about. The triangle feature works a little bit like Tilted, but it makes more sense because you are using a three point set for an object that has three points. I do like and have used the Triangle feature with ease and with predictable results. Now it is time to play with these options and see what they can do. Have fun! If I want to fill a triangle area with a pebble design, is there a way to do it with a block pebble pattern so that the triangle area is filled. No matter what I do, it is either in the center and real small or stretched, but does not fill the triangle or is out of the triangle. Any help appreciated. Is there any way to fill a triangle area with a pebble design using a block pebble design. Every placement method I use, the design is either centered in the triangle with large empty areas or it is stretched out of proportion with large empty areas or it stitches outside the triangle area. Any help would be appreciated. 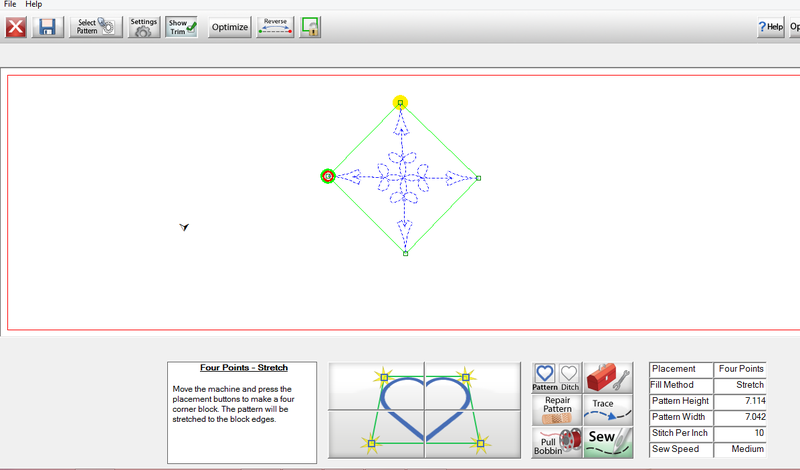 You would need to design the triangle in Design and Create Pattern. I would Record the triangle so that I had the shape correct and then put that into the back layer, then do my designing on the top layer. 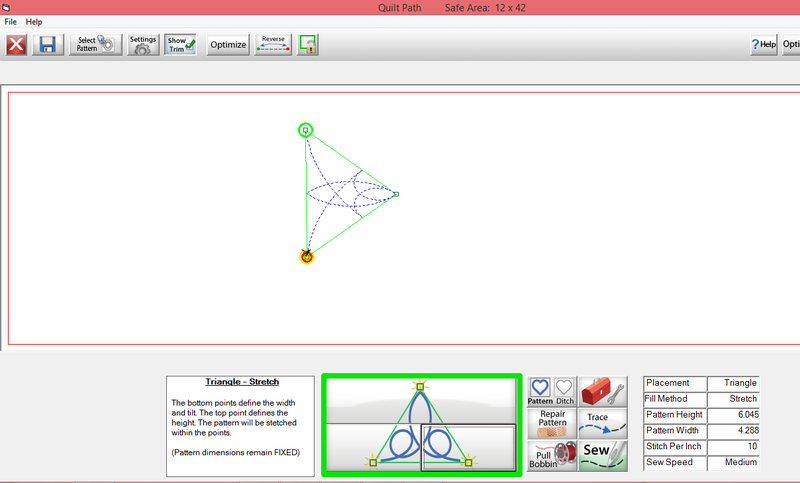 That would give you a triangle that was closer to the right shape to begin with so that when you stretch the pattern it is not distorting as much. I understand how to mark the three points in the triangle but what do you do to flip the triangle so that the point is down andb the flat side is on top. You buttons are just for you to know what you are pushing. If you move the machine to the bottom point and tap the top button it will vertically flip the triangle. If you also need to flip in horizontally you can use the opposite buttons.